Three new bidders are reported to be interested in Saab. MUNICH -- General Motors Co. is close to deciding which of Saab's bidders will proceed to final negotiations, Swedish news agency TT reported, citing a source. The report said the buyer which GM is leaning toward has experience in car production on a small scale and that it plans to run a full-scale car production line including design and development in Sweden. It said the preferred buyer is one of the groups already mentioned in the press, and that all in all, TT said, this pointed to Spyker as a favorite. Saab spokesman Eric Geers declined to comment on the report but said it was evident things would have to unfold soon. "There are signals everywhere showing we are well on track," Geers said. Spyker first said on Dec. 2 it was interested in Saab, which GM is scrambling to sell after a deal with Koenigsegg Group AB, a consortium of private investors that includes supercar maker Koenigsegg Automotive AB, collapsed last month. GM has said it would hold on to Saab through year's end and close it if the brand cannot be sold. GM is also talking to BAIC, China's fifth-largest car maker, about a partial sale of assets associated with its Saab brand, including tooling and technology, two people with direct knowledge of the discussions told Reuters earlier this week. 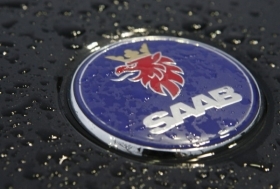 Sweden's government appears to be increasing pressure on GM to make a decision on Saab soon. Swedish daily Svenska Dagbladet said on Thursday that Joran Hagglund, the state secretary at Sweden's Enterprise Ministry, has told GM it needs to decide this week whether to sell the money-losing business. GM said it could continue to finance Saab after its self-imposed deadline of the end of this year, if a buyer has been identified by then. GM spokesman Chris Preuss said negotiations could continue with a buyer next year. "Yes, we will continue to run Saab during that period. But I think that ... a decision about Saab is going to come very soon," Svenska Dagbladet quoted Preuss saying.